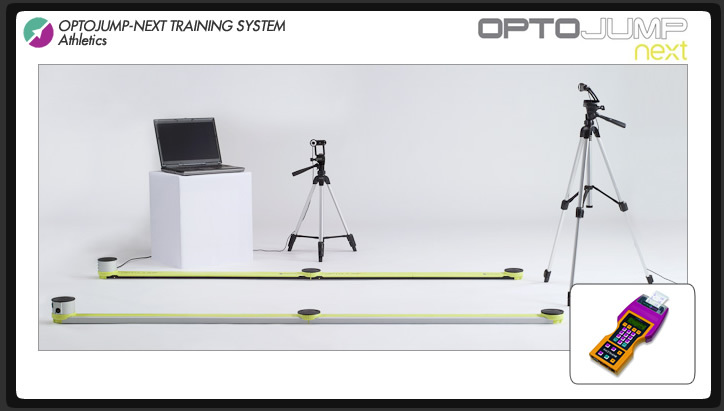 The OptoJump NEXT Training System for Athletics is an optical measurement system consisting of a transmitting and receiving detection bar on each side of the inrun, designed for high-precision analysis of reaction times, jumps, and other key data for Athletics. It provides completely electronic measurement of contact & flight time to a precision of 1/1000s, with no moving parts to jam or break. Each of the detection bars contains from 33 to 100 LEDs, depending on the selected resolution. The LEDs on the transmitting bar communicate continuously with those on the receiving bar, so the system detects any interruptions in communication between the bars and calculates their duration. This makes it possible to measure flight and contact times during the performance of a jump, yielding an accuracy of 1/1000 of a second. Starting from these fundamental basic data, the dedicated software makes it possible to obtain a series of parameters associated with the athlete’s performance with a maximum of accuracy and in real time. The absence of moving mechanical parts ensures accuracy and high reliability. OptoJump NEXT allows users to acquire flight and ground-contact times in an extremely simple and accurate way. By connecting to either a PC or a Racetime2 timer, the system allows the acquisition of data for the measurement of explosive and elastic force, including the measurement of the reaction times to visual and sound signals. Without resorting to more complicated and invasive analyses, it is now easy to obtain all kinds of key athlete data. The system offers the coach/trainer numerous on-demand evaluation indicators such as: number of jumps, contact time, flight time, height (measured in centimeters), rhythm, specific energy (J/kg), specific power (W/kg), total energy (J), total power (w), and other values. It is also possible to mount OptoJump on a standard treadmill by placing the bars at the side of the belt. Having noted the speed of the belt, the program records the contact times, flight times and the step length of the athlete while running. OptoJump NEXT can be used in combination with a PC through direct connection to the serial port or USB port (using the PC-based OptoJump Software), or with the Racetime2 timer for onsite acquisition of data where use of a PC is impractical. To use the system, all you need to do is position the two optical bars on the ground, placing them opposite each other up to 3 meters apart (approx 10'; a green LED signals that positioning is exact) and connect the dedicated cable to the socket of the Racetime2 timer. All data acquired during the training sessions are stored and optionally printed by the Racetime2 and can be subsequently transferred to the computer. In addition to the Racetime2's OptoJump NEXT program, the handheld unit is equipped with supplementary timing programs for the evaluation of sprints, shuttle tests, tests for direction change, and other useful functions. 1 Racetime2-PC data transfer cable. ASK ABOUT OUR DEMO KIT!